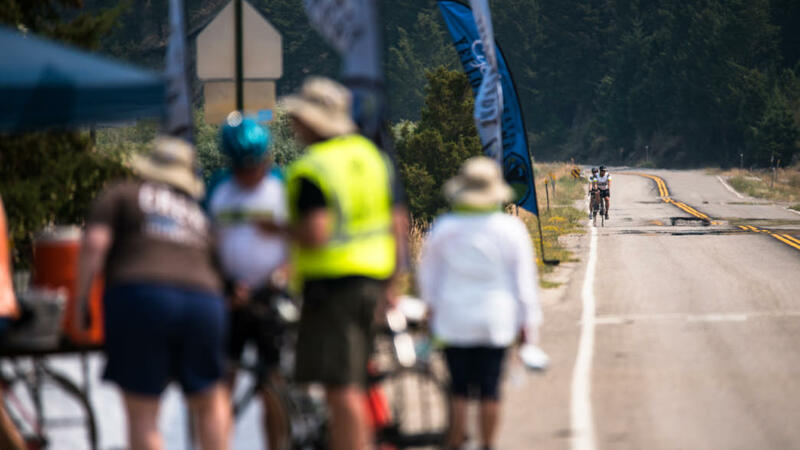 On Day 4 of the 350-mile Cycle Greater Yellowstone tour, you’ll ride 60 miles through Pine Creek Pass and then follow the Snake River to the backroads of Idaho. Thankfully, you’ll be fully recovered (or slightly hungover, depending on how many breweries you stopped at) after your rest day in Driggs. This leg features a whole lot of climbing and descending. Your first long climb is a 4-miler from Victor to the top of Pine Creek Pass—but it’s right at the beginning so your legs should be nice and fresh. Pine Creek Pass is scenically sheltered by (you guessed it) pine trees on both sides of the smooth, straight road. After navigating the pass, you’ll follow a section of the 1078-mile Snake River, the primary river in the Pacific Northwest, and take in the beauty of the Snake River Plain—an utterly different landscape than the one you just pedaled out of. The river was created during the Ice Age by a volcanic hotspot, and begins its southern trajectory from Yellowstone National Park. At the end of the ride, make camp along the Snake River at Twin Bridges Campground, aptly names for the two bridges (obviously) that lead campers in and out of the park. The park itself sits on the shores of Snake River, the same river which you have been riding along for much of the day. Bird-watching is popular in the park, so take a stroll around and see what wildlife you can spot. Once settled, be prepared to spend the rest of the day at camp versus heading into the teensy town of Archer. The good news: This out-of-the-way spot is a chance to relax and enjoy the beers provided by Cycle Greater Yellowstone’s sponsor, Uberbrew. They're providing beer to the cyclists each night and you aren’t going to want to miss sampling every beer on their menu. Just back from the Great American Brewing Awards, Uberbrew basically swept the event. They took home the titles of Small Brewing Company of the Year and Small Brewing Company Brewer of the Year, and won Gold medals for their White Noise (American-Style Wheat Beer with Yeast) and Humulus Insani (Imperial IPA). They also took home a silver for their Average at Best (Double Red Ale) and a Bronze for their Alpha Force Double Tap (American-Style Black Ale). For non-beer drinkers, don’t panic, there’s wine every night and non-alcoholic beers as well, and if you opted for a distillery tour on Day 3’s rest day, you can sneak a few nips from the booze you undoubtedly bought there instead. As for camp food, you’ll have a choice of regular or vegetarian menus along with gluten-free options. In case you were starting to wonder about food options, each day begins with a breakfast buffet, and each ride has at least two rest stops stocked with snacks. Lunch is ready when you pull into camp, and dinner is served each night at the camp— it’s all included in your registration.